If you see this man, Vic Hallam, he will only be to happy to tell you about the dambusters and the history of the valley itself. 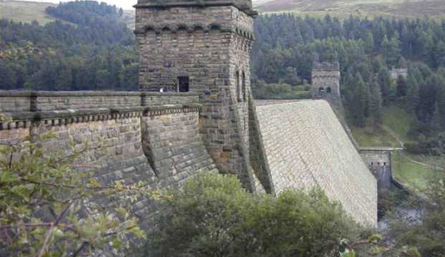 This is a picture of Derwent Dam in the Peak district. Just off the A57 halfway between Glossop and Sheffield, Located between the Ladybower reservoir and the Howden Dam, for six weeks prior to the attacks on the great dams of Germany.This dam was used by the Lancaster bomber pilots to practice the bombing runs and target practice.Much to the annoyance of the local population.The reason for this dam being used is it s close resemblance to the German dams. The silence was broken again over this dam in 1954 with the filming of “The Dambusters” starring Richard Todd as Guy Gibson, during this time three aircraft were used (one Lancaster & two Shakletons) to recreate the near impossible task of low level flying plus the added danger of flying at night, filming took place over a two week period and was filmed during the day, if you watch the actual film you will notice it is nightime. This was created by over exposing the film. The peace and tranquility was broken yet again in 1988 during the 45th Anniversary with a flypast by the Battle of Britain Memorial Flight. Vic s museum contains a wealth of information on 617 squadron, this is the best place to purchase original and genuine prints and signatures from members of the squadron, and all he ask s for is a donation. Most prints would cost you a fortune from any art dealer. This is a very popular site to visit, you can walk for miles in the beautiful peak district country side or you can hire bikes for the more energetic. The water level in the Ladybower reservoir during a dry spell can drop that much that the remains of the lost village of Derwent reappear (take a camera).Just a few miles down the road you will come across the famous Blue John mines. Drop in on Vic Hallam and this exhibition, he is a mine of information regarding all aspects of squadron 617.